Ciaran Clark’s goal – Clark receives the ball, strides forward, and takes aim from 25 yards. The ball strikes Gallas’ shoulder and wrong-foots Friedel, finding the top corner. Hutton finds Ireland in space beyond our midfield. …who lays the ball back for Clark. He has nothing out wide and no real options down the centre and so, with no pressure on the ball, he takes a pot-shot. Gallas, more concerned with protecting his face than blocking the shot, turns his back on the ball, and it loops up off his shoulder. what is the point of this analysis...do you think the coaching staff, players and manager are reading??? Troll. We appreciate your analysis Windy. Good to slow it all down and see where mistakes were made. Alot of people enjoy it so why dont you go and give Mary Whitehouse a good seeing to instead of reading this?! I suggest that if Anon isn't a fan, he/she needn't bother wasting his/her time reading it in future! Thanks for this Windy - always good to read. Looks like more than 25 yards to me - such a soft goal - the one thing I have admired about Cheatski recently is their blocking in front of goal, I agree Gallas was weak here but Clark got lucky, just shows what can happen if you give it a go. Cheers Jill! Absolutely - we don't take on enough shots from distance IMO. Often worth having a go if there's nothing else on. Tottenham have fired in 92 shots on target from outside the box this season, more than any other side. 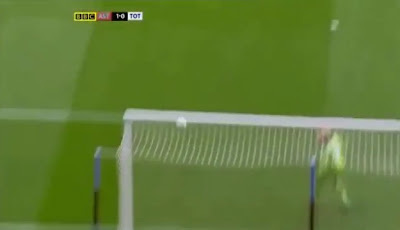 If you watch from behind the goal, it didnt actually change where in the goal it was heading. Without the deflection, it was heading for the same corner and the deflection happened over 20 yards out... Why didnt Friedel move? Gomes, I admit is far from perfect, but even if he couldnt get there, would have been half way accross his goal trying.. Friedel's lack of mobility is really getting to me. Multiple crosses / corners within the 6 yard box again yesterday, Friedel nowhere to be seen. I agree that it didn't move much, but deflections nearly always wrong-foot a keeper. & forgot that guy above.. It may seem to some negative to analyse goals conceded, but some people who think they know everything about football, actually know very little, so the more in depth detail like this should help them... I enjoy it and no one else online seems to do anything similar, so it's different to the usual blog. I don't think his reactions are what they once were but I won't blame him too much or this one. Windy what would your analysis be on Redknapp bringing on Parker yesterday, instead of Defoe and then putting Gallas up front? Great blog mate and much appreciated. I am not saying he would have got there... But so often he seems rooted.. Has he always been this immobile, or has age caught up with him in this respect? I think the latter... could be his last full season methinks. New keeper top of the list for next season. Gomes made mistakes trying to come and help his defenders. Friedel avoids such mistakes by staying on his line but that means he gives no extra help to his defence. Both Gallas and Friedel should be responsible for this goal. We are weak in mentality. How can Gallas turned his face instead of trying to block the ball. We need to buy a top goalkeeper (and CBs) this summer. Harry should be criticised for not substituted Defoe in and trying to get three points. It was a must win game if we want to regain the third spot to ensure a CL spot and finish above our rival. Very frustrating that Gallas did this IMO. He could have closed Clark, but that may have left space for Heskey behind him. AS a GK you cannot guess a deflection as it can go anywhere in a 30 degree funnel(ie 60degree in total). This usuall removes that split second you have to either cover the further distance if wide, or turn in if more acute but up or down. Face it!! It was one of those freakish a**ey goals that no one can stop but which we often give away. You become a little less upset after 60 yrs of it believe me and I haver seen some whoppers. I remember Friedel was an unlucky goalie when at Villa with shots looping over him with deflections. I suppose these average themselves out over a career, but ironic it should happen on his return to Villa Park. Not sure he had another shot to save all day. No... I did think he invited pressure by not coming and claiming/punching a few corners though. [email protected] 7.55. Richard Dunne was playing for Villa and he currently holds the record for own goals, 6 I think. Then as if by irony we go behind to an own goal, and only score ourselves from the spot....utter garbage against a poor Villa side!!! the woolwich player scores against us to keep woolwich above us? Ha, that thought crossed my mind too, bonse! ....I would like to know how a deflected shot from 30 yards caught the old cuzt "wrong-footed"!!! Fuk me the shot was pretty central to the goal, and taking the deflection should slow the ball slightly, but Brad Fukall WAS NOWHERE TO BE SEEN!!!! As the ball went in he was just rooted to the fukkin spot! First time I have ever seen just how SH!T Brad can be when he wants to be! And WTF was Twitch doing bringing on Scotty instead of JD WITH 5 MINUTES LEFT in a game WE HAD TO WIN?!!! Honestly, Twitchs substitutions and team selections are just fukkin nonsense! Bit harsh - deflections hard to adjust for regardless of how far out. There's missing something.....the analysis is not completed.... I mean, you forgot to call Modders getting caught "ball-watching" again. I didn't forget - he wasn't this time. Do you disagree with previous analysis? Face up to it Windy the first poster is on to something. If you didn't analyse the goals conceded then we would obviously keep clean sheets in every game. You have created a cottage industry here and I am guessing that you pay the boys to concede just so you have something to do. Our senior staff manager can't read anyway so he won't gain much from your blog. Haha, cheers as ever Jimmy :) You put a smile on my face. Forget about the goal conceded, which was a fluke, what was concerning was the lack of shots on goal. Ignore the brickbats, your analysis is very welcome and actually it would be great if you would expand your analysis to other critical aspects of the game.